In India, the irrigated area consists of about 36 per cent of the net sown area. Presently, the agricultural sector accounts for about 83 per cent of all water uses. The remaining uses include 5, 3, 6 and 3 per cent respectively, by domestic, industrial and energy sectors and other consumers. Increasing competition with the other water users in the future would limit the water availability for expanding irrigated area. In traditional surface irrigation methods, the losses in water conveyance and application are large. These losses can be considerably reduced by adopting drip and sprinkler irrigation methods. Among all the irrigation methods, the drip irrigation is the most efficient and it can be practised in a large variety of crops, especially in vegetables, orchard crops, flowers and plantation crops. In drip irrigation, water is applied near the plant root through emitters or drippers, on or below the soil surface, at a low rate varying from 2 - 20 lit res per hour. The soil moisture is kept at an optimum level with frequent irrigations. Drip irrigation results in a very high water application efficiency of about 90-95 per cent. A typical drip irrigation system is shown in fig. 1. The use of drip irrigation can be traced back to the ancient custom in certain parts of India of irrigating a tulsi plant kept in the courtyard. During the summer months, the plant was irrigated by a hanging pitcher containing water and a minute hole at its bottom to allow the trickling of water on to the plant. The tribal farmers of Arunachal Pradesh practised a primitive form of drip irrigation system using a slender bamboo as the conduit for water flow. The use of drippers in sub-surface irrigation network was first experimented with in Germany in 1869. 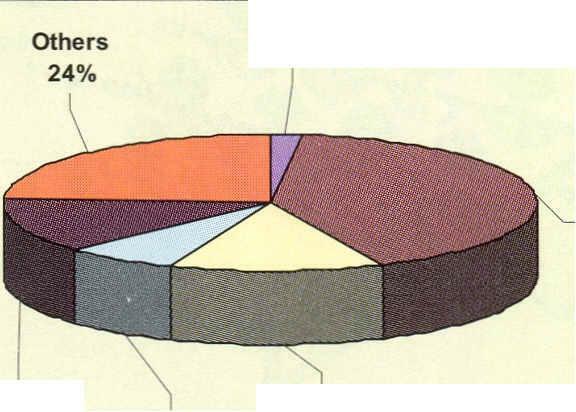 The conspicuous growth of the petrochemical industry during and after the 1950s facilitated manufacturing of plastic pipes at a cost much cheaper than the cost of metallic or cement concrete pipes. Plastic pipes are convenient for water conveyance under pressure and the plastic material are easily formed into the desired configuration. These features of plastic made the field-scale use of drip irrigation practicable. The drip system was developed for field crops in Israel in the early 1960s and in Australia and North America in the late 1960s.The area under drip irrigation system in the USA is about 1 M ha, followed by India, Spain, Israel, etc. In India, there has been a tremendous growth in the area under drip irrigation during the last 15 years. At present, around 3.51akh ha area is under drip irrigation with the efforts of the Government of India, while it was only 40 ha in 1960. Maharashtra (94,000 ha), Karnataka (66,000 ha) and Tamil Nadu (55,000 ha) are some of the states where large areas have been brought under drip irrigation. Many crops are irrigated by the drip method in India with the tree crops occupying the maximum percentage of the total area under drip irrigation, followed by vine crops, vegetables, field crops, flowers and other crops, as shown in fig. 2. Drip irrigation system is suitable for all orchard and vegetable crops. 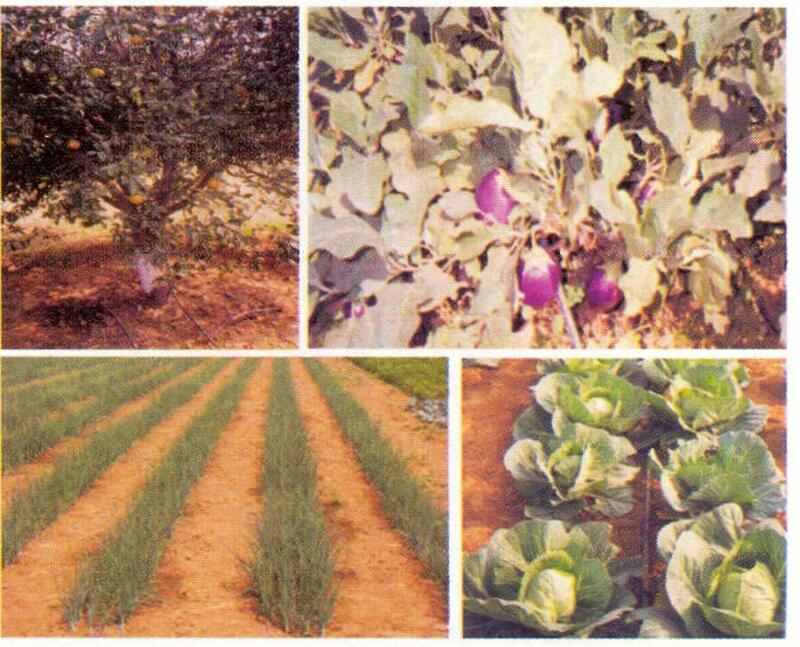 Drip irrigation system has also been successfully employed for close growing field crops including onion and okra (fig 3). The National Committee on Plasticulture Applications in Horticulture (NCPAH), Ministry of Agriculture, Government of India (GOl) has estimated a total of 27 million hectares area in the country that has the potential of drip irrigation application .